Lawrence Market at Yonge Street. Live just minutes from the financial district and all the action at the Sony Centre for the Performing Arts, the Air Canada Centre, and Rogers Centre. Spend quality time with friends at the many exciting bars, bistros and nightclubs in the entertainment district. Backstage, a condominium address where you are both the performer and the audience. Welcome home. 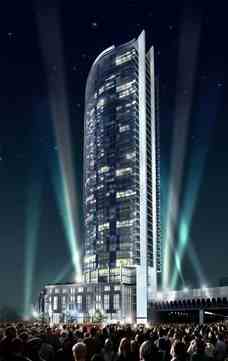 36 storey, glass point tower with sleek. slender lines of steel and shimmering glass inspired by architect Page + Steele. Upscale urban interiors designed by Munge Leung, and landscaping by the internationally recognized firm Claude Cormier. Panoramic views of downtown Toronto and Lake Ontario. Future connection to the PATH concourse running throughout the downtown core. Amenities include a rooftop garden with a 70 foot infinity pool and lake view. Soaring 9 and 10 foot, smooth finished ceilings, as per plan. 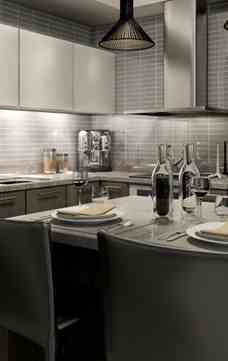 Contemporary kitchen cabinetry with extended height uppers and under valance lighting. Granite kitchen countertops with under mount sink and ceramic backsplash. Bosch appliances include cook top stove, built-in oven, built-in dishwasher, built-in microwave/hood fan, and stacked, front load washer and dryer. Fisher Paykel refrigerator with bottom mount freezer. Bathrooms include floating vanity cabinets with slab marble countertops. Ensuite bathroom floors offer choice of marble, porcelain, or oversized ceramic tile while main bathrooms include choice of porcelain or oversized ceramic tile. Architect : IBI Group/Page & Steele Architects Inc.